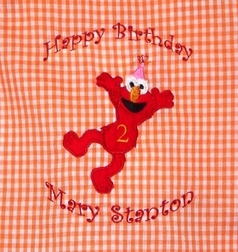 Caroline Bradlee Designs > BIRTHDAYS > GIRLS > Girl's Elmo Birthday Custom Dress Or Outfit & Birthday Hat. 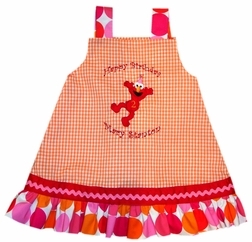 Happy Birthday Elmo in a birthday dress or outfit for girls. We take 1/8 inch orange gingham and pair it with the wonderful Michael Miller Disco Dot fabric in pinks, orange and red. Above the ruffle of the dress/top we put red grosgrain ribbon with candy pink ric rac on top. You can choose to have the happy birthday saying and name as shown with Elmo or just Elmo and your little one's name. And, we just had to design a birthday hat to match! The body of the hat is made with the dotted fabric as shown. Orange maribou embellishes the top and bottom rim of the hat. Orange and red gingham ribbon streamers float down from the top of the hat.